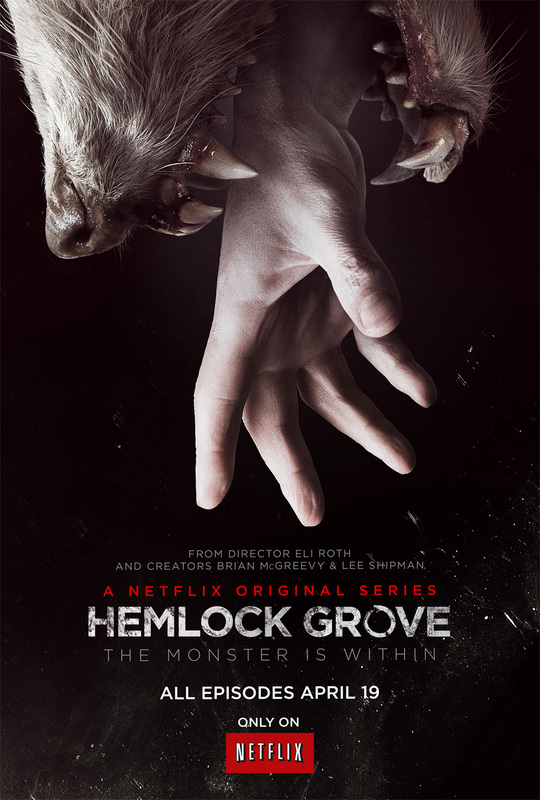 A girl is brutally murdered in a small town named Hemlock Grove. Her wounds seem to be caused by a wild animal. Since Christina – a curious teenage girl who calls herself a novelist – tells everyone that Gipsy boy Peter is a werewolf, he becomes the main suspect in this case. In the meanwhile Peter makes friends with Roman Godfrey, whose parents seem to own the town. But Roman’s mother doesn’t approve with their friendship. Is Peter really a werewolf? And what secret lies on the Godfrey family? So, at the end of April Netflix released the complete first season of its original series. And all I can say is: What a waste of money and a good idea. The first episode was very interesting, even though it didn’t seem very polished, but a lot of pilots don’t look too expensive and evolve throughout the season. Actually it didn’t change in this show but it emphasized the dark mood of the setting, I guess, which was fine with me. Furthermore the pilot brought up many questions and the actors seemed very engaging. But as I continued watching, the story didn’t seem to go anywhere, some characters had flashbacks that weren’t even worth mentioning, the script was filled with meaningless dialogues, but the most bizarre thing was that out of the blue some scenes ended up in a lesbian moment. I mean I don’t mind a gay twist, but it didn’t fit in this show. Or did it fit perfectly because it was just as random and weird as the storyline? The moments that were supposed to be suspenseful and made you want to see more made me yawn, and I understand why Netflix released the whole first season at once: If I watch a show and an episode ends, I am supposed to be excited and want to see the next one, but this wasn’t the case with Hemlock Grove. If they had released an episode each week, people would have forgot about it and stopped watching. But I am sure they thought the same thing I did: ” What the heck, I got all episodes so why not continue?” It turned out to be a waste of time. The conclusion was not impressive and I really didn’t care for the characters. The actors did a great job, but as I always say: Good actors can’t make up for a crappy script.